Too busy to start from scratch, but excited to start learning how to use an API-based CMS? Get a blog up and running in minutes. Modify and adapt it to your liking, it's all yours! For this project, we provide you with all the source code you need to get your blog up and running. After you set up your content repository we will show you how to configure the code and see your content in action. This blog's homepage contains a title, a description and an image. Let's create a custom type with the corresponding fields. We will only need one instance for the homepage, so we will set it up as a Single Type. In the repository you've just created, go to Custom Types, create a new type, select Single Type, and give it a name of Blog Home. Make sure that the system automatically assigns it the API ID of "blog_home". Once created, paste the following JSON into the type editor. Save. In the designed blog post layout, we give the possibility to alternate paragraphs, quotes and images. Images can be displayed in full width with a nice overlay, or centered in the body with a caption below. We use content slices to define this layout in the custom type. As an author you'll be able to freely compose your post's body by alternating those components. We will need to be able to create more than one blog post, so this will fall into the category of repeatable type. Create a new type, select Repeatable Type, and give it the name Post. Make sure that the system automatically assigns it the API ID of "post". Once created, paste the following JSON into the type editor. Save. "placeholder" : "Blog Post Title..."
Start by filling in your photo, your name and a headline for your blog's home. 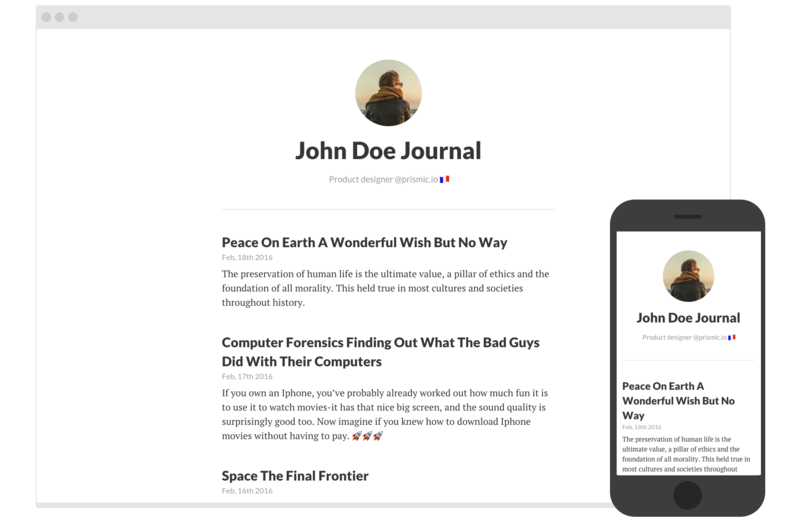 Go to "Content" and hit "New", choose the Blog's home type and fill it with your own content. Save and publish! Now, write a few blog posts. Make sure to fill the mandatory UID field that is used for your post's URL. Save and publish! Time to see thinks working! First, dowload the blog source code. Let's modify the link in our configuration file to point to our repository's API endpoint. Fire up a terminal (command prompt or similar on Windows), point it to your project location and run! You should easily find what to modify in the code to customize the blog: just edit the stylesheets and the templates to fit your design!